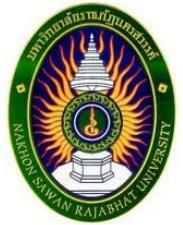 Nakhon Sawan Rajabhat University is located in Nakhon Sawan Province about 235 kilometers north of Bangkok along the Asian Highway. The province is the gateway to the northern region of the country. Nakhon Sawan Rajabhat University covers an area of about 109 rais (1 rai = 0.3952 acres), including Nongkrot Campus (16 rais) and Khao Raet Campus (160 rais). Getting to Nakhon Sawan Rajabhat University is easy. Direct mini – bus services from downtown stop right in front of the campus. All buildings are within walking distance. There are more than 200 academic staff including Associate Professors, Assistant Professors and Senior Lecturers. They teach approximately 8,000 students. More than 40% of students are in – service training students. A local university which conserves Thai cultural identity and brings knowledge to communities. Nakhon Sawan Rajabhat University are be graduate educational Institutes for local development with the following objectives to provide academic and a high level of vocational education; conduct research as an academic service to the general public; improve, transfer and develop technology; preserve and promote art and culture produce teachers and elevate the status of teachers. Faculty of Agriculture and Technology.